Personalized Baby Girl Silver Picture Frame - Engraved Beautiful Butterfly Silver Photo Frame You beautiful baby girls picture will look adorable in this Engraved Butterfly Silver Frame. Give our personalized baby frames to any new parent or grandparent as a wonderful keepsake that lasts a life time. Our New Baby engraved butterfly photo frame measuring 5" x 5" holds a 3" x 3" photo makes a perfect gift for the new baby, it's parents and grandparents. Engraved baby frame includes free personalization! Personalize your Butterfly Photo Frame with any new baby's name. 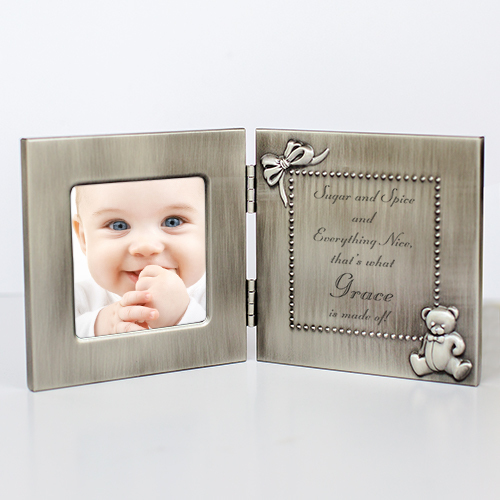 Engraved photo albums also makes a unique engraved gift idea for a child's birthday. Grandma and Grandpa would love to show off their new grandchild in this engraved baby frame.